Taste test: These chips were crunchy and had a nice peppery taste, with maybe a slight cheese flavor mixed in, a nice taste. 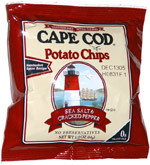 The chips were a it less crisp than the regular Cape Cod chips. There were some large chips in the bag, whch is unusual for small (1/2 oz.) bag. There was also a nice delayed peppery aftertaste. Smell test: Nice, sharp peppery smell. 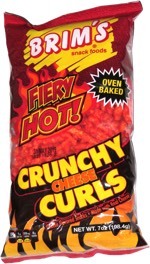 This snack was discovered by Jeremy at The Big E. Review published .